You’ve probably heard steel described using initials such as EDDS, IF, DS, DP, AHSS and the like. Some—but not all—of these terms mean the same thing. Steel is composed mostly of iron and an assortment of other elements, either intentionally added to change certain properties such as strength or corrosion resistance (alloying elements) or too difficult to remove from steelmaking (residual elements). Reducing carbon and manganese lowers strength, increases formability and makes steel easier to weld. However, 0.04 percent denotes the practical lower limit of carbon achievable when using conventional steelmaking techniques. With some special mill practices, steelmakers can lower the carbon to 0.02 percent. This allows for the production of a more formable grade known as deep-drawing steel, or DDS. A molten-steel heat must undergo an additional step of vacuum degassing to achieve even lower levels of carbon, hydrogen and oxygen. These dissolved gases bubble out of the melt at the lower pressures associated with a vacuum in the same way as popping a beer-can lid reduces pressure and forces the beer to bubble over. In a steelmaking plant, a vacuum-degassing unit may cost $50 million to install, which is why not every company offers ultra-low-carbon (ULC) steels. Any pure element is very soft. For this reason, wedding bands never are made from pure 24-carat gold. Other added elements give the ring strength and hardness, reducing the designation to 18-carat gold (75-percent gold and 25-percent alloying elements) or less. Pure iron is similarly soft. Elements added to iron to change the properties include not only carbon and manganese, but also silicon, phosphorus, titanium and others. ULC steels typically contain carbon levels between 10 and 50 ppm (0.001 to 0.005 percent), and half the manganese of drawing steels, making ULC steels very similar to pure iron. This is why ULC steels sometimes are described as extra-deep-drawing steel (EDDS). At a microscopic level, pure iron (or any other element) looks like a 3D network of racked billiard balls, all of the same size. 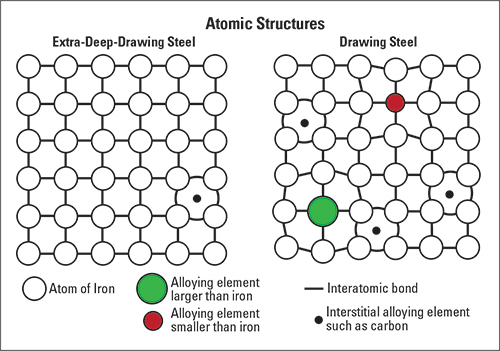 To make a steel alloy, some of the iron billiard balls are replaced with ones made of manganese, silicon, phosphorus, titanium, etc., similar but not identical in size to the iron balls (see the Atomic Structures graphic). The disruption in the pure-iron atomic network caused by these alloying additions causes what is known as solid-solution hardening. As the alloying increases, the straining in the atomic 3D structure increases, requiring more force to deform the sheetmetal. This results in what we call higher-strength steel. Alloys added at low levels result in an atomic network that is still mainly iron, and, therefore, relatively soft. Even with all atoms touching, small gaps called interstices exist. Only much smaller atoms, such as carbon and nitrogen, can fit within these gaps, and thus are called interstitial elements. In ULC steels where the carbon level rests below 50 ppm, most of the interstices are not occupied, leading to the term interstitial-free (IF) steel. As noted, these ultra-low carbon levels result only from vacuum degassing, hence the term vacuum-degassed interstitial-free (VD-IF) steel. Therefore, ULC, IF, VD-IF and EDDS all mean the same thing—the most formable and dent-prone grade of steel. Learn about high-strength-steel grades and formability, tool steels and coatings, presses and die design, and effective lubricant strategies at PMA’s two-day Stamping Higher-Strength Steels Seminar in Nashville on September 12-13. Visit www.pma.org for details and to register, or contact Marianne Sichi at msichi@pma.org for more information.